The world of aviation, with its technical fascination and wealth of adventurous heroes, has always been a source of passion prompting the dreams of mankind. A host of industrial sectors find their roots and their direction for development in this field, thanks especially to the constant progress made in aeronautics. Collaboration with watchmaking companies in the area of instruments for measuring was quite vital in the old days. The arrival of computerization in the cockpit, with its extreme precision, has meanwhile enabled amateurs of this sector to enjoy its instrumentation. Perrelet, specialising in the creation of energy through movement since 1777, was impressed by the power of the propulsion of aeroplanes, generated by its key element, the gas turbine. Focusing on this external component, an ingenious rotating device exploiting the force of the air, Perrelet has established a clear connection with its double rotor and the launch of its new collection: TURBINE. 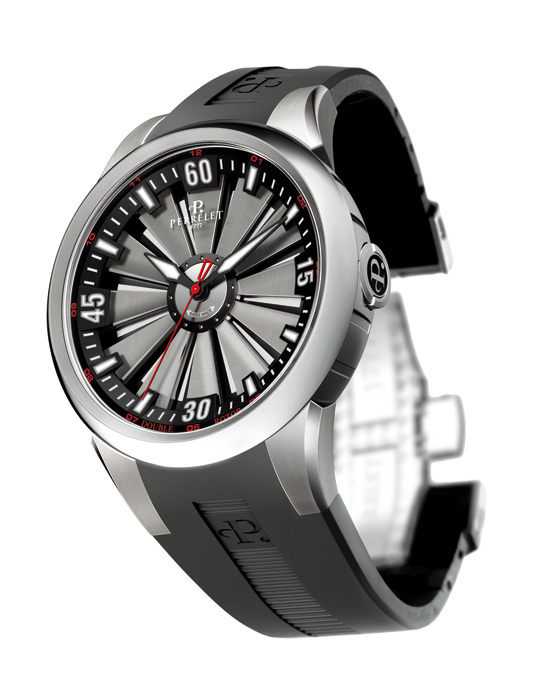 The new TURBINE models are exclusively equipped with the Perrelet P-181 automatic Double Rotor movement. The exceptional design of this collection could have come from the drawing board of a reactor engine designer or a state of the art technology research office. In fact, the TURBINE came to life from the drawings and technical research of our watchmaking engineers, who have defied the laws of gravity. The double rotor, transformed for the occasion into a turbine fitted with 12 blades made of titanium, covers the whole of the dial and slips beneath an interior black raised area, showing luminous numbers. On the under dial, luminous markers accentuate the optical effect and make the impact of this model all the more sensational. Respecting the specifications of a fuselage and its aerodynamics, the turbine is housed in a 44mm concave-shaped case, perfectly recreating the original appearance of the reactor. Even the crown, specially worked and integrated in the case, respects these perfect lines. Its functionality is assured by a latch which in the open position allows winding and resetting. On the reverse side, a sapphire crystal reveals the black lacquered bridges, angled and polished. The oscillating weight, whose design is particularly inspired by the aeronautical sector, exhibits the same quality of finish. A black rubber bracelet with its folding clasp completes the ensemble, ensuring its owner complete comfort. The TURBINE collection is available in plain titanium, DLC-treated titanium or in the noble material of 18ct pink gold. According to Isaac Newton’s third law of physics, “For every action there is an equal, opposite reaction”. Fortunately, the TURBINE by Perrelet will not propel its owner into the air, but it will deserve his admiration, beyond any shadow of doubt.